Robert Hardesty graduated from Western Military Academy in Alton and won national acclaim as an administrative assistant to President Lyndon B. Johnson's historic "War on Poverty." Rey Scott, another cadet at Western Military, rose to fame with an honorary Academy Award for his film "Kukan," a documentary about the Japanese attack against China. The education of Hardesty and Scott at the military academy in Upper Alton helped prepare them for careers in U.S. government and award-winning filmmaking. Western Military was founded in 1879 by A.M. Jackson on Seminary Avenue in the historic Upper Alton neighborhood and graduated hundreds of outstanding students until it closed in 1971. Western Military was world renowned for its heroic military leaders on the battlefields of World War II, for its world record holders in athletics and for leaders such as Hardesty and Scott. Hardesty was a talented 16-year-old student who enrolled as a cadet in 1945 at the academy in Alton. He learned skills in leadership and military tactics and excelled in dramatic productions at the academy. He was a talented writer, a trait which someday would win him national acclaim in the U.S. government. Hardesty and the other cadets marched in their military uniforms in Memorial Day parades to a cheering crowd along College Avenue in Upper Alton. He graduated from Western in 1949 and enrolled at George Washington University, where he developed a love for politics and writing. His writing skill was admired by President Johnson, who hand-picked him to be an administrative assistant and speechwriter in the White House. Hardesty was a speechwriter and adviser to Johnson in the president's historic War on Poverty. He wrote the president's speeches during the turmoil of the nation's civil rights struggles in the 1960s. Hardesty described his role as the president's assistant in the War on Poverty as "the most exciting and stimulating of my life." Hardesty was asked if Johnson was a persuasive speaker. He answered: "LBJ sold civil rights to the Southerners, wage restraints to union leaders, Medicare to doctors and price responsibility to corporation presidents." Cadet Rey Scott showed his skill on the baseball, fencing and equestrian teams at Western Military Academy in Alton. Scott left the academy in 1921 and became a world-renowned adventurer, documentary filmmaker and foreign correspondent for the London Daily Telegraph. He returned to the academy in Alton to show his prize-winning news photographs and documentary adventure films to admiring cadets. Scott told the Alton cadets that he was filming an event in Hawaii in the 1930s when his life as a documentary filmmaker was suddenly thrust into the world spotlight. In Hawaii, Scott said he met a woman who had escaped from China, which was under attack by Japanese military forces. She persuaded Scott to travel to China to film the persecution by Japanese soldiers. Scott said he took a small 16mm camera to China and the result was a famous film titled "Kukan," a documentary of Japanese attacks against China. He stood on the roof of the U.S. embassy and filmed Japanese planes dropping tons of bombs on defenseless people in the Chinese city of Chongquing. Bombs were dropping around Scott as he filmed the historic attack on the city. He smuggled his historic film out of China inside bamboo poles that held his luggage. In the United States, Scott's film captured headlines of newspapers across the country. Bosley Crowther reviewed the film for the New York Times and called it "one of the most awesome bits of motion picture yet seen in this day of frightful news events." President Franklin D. Roosevelt invited Scott to the White House for a private showing of the documentary. Scott received an Honorary Academy Award for the film "Kukan." An old copy of the 16mm film is being restored by the Academy of Motion Picture Arts and Sciences. 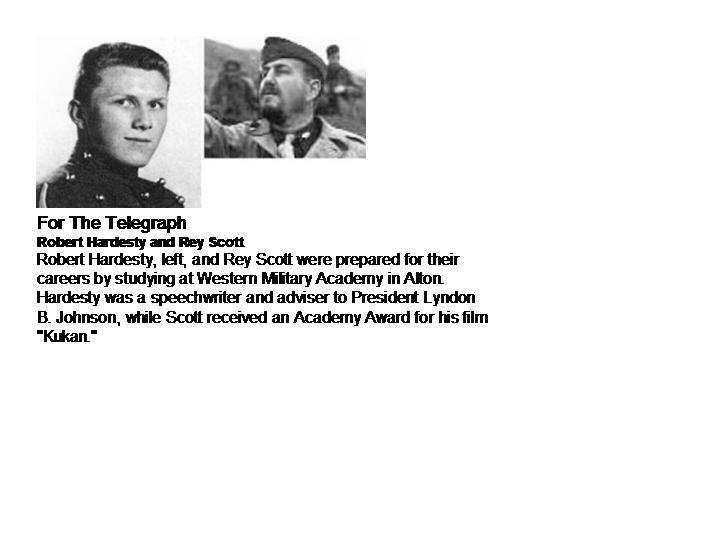 At Western Military Academy in Alton, Scott was a hero to the young cadets for his fame as a world-renowned adventurer and filmmaker.